All transactions are safe and secure with a reliable history in online purchasing behind each of our associates. Buy the Tick Tock Girl Alice in Wonderland Alice t-shirt to own Alice in Wonderland clothing and merchandise. 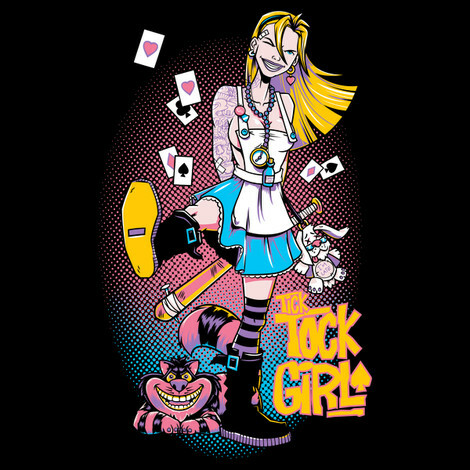 This Tick Tock Girl design was inspired by Tank Girl and features Alice as part of that world. Her stare looks as if she has caught a glimpse of the Mad Hatter's hat or the Cheshire Cat's wide eyes and creepy grin. Recall her story, including the teapots, cups with saucers, memorable quotes and the tree where her adventure begins. Wear this tee to show off the unique illustration of the main character. Catch one of these Alice in Wonderland t-shirts before they get away. "What an idea... A crazy, mad and wonderful idea." In addition to the Tick Tock Girl Alice in Wonderland Alice tee above, browse the Alice in Wonderland Clothing Gallery for more apparel like men's and women's clothes, kids shirts or hoodies.